For the study, researchers examined data collected from one-time surveys of 30,272 people aged 20 to 75 years about their smoking habits, e-cigarette use and respiratory symptoms that might indicate breathing diseases like asthma or chronic obstructive pulmonary disorder (COPD). Overall, 3,694 people in the study, or about 12 percent, were current smokers; 7,305, or roughly 24 percent, were former smokers; and 529 participants, or 2 percent, were e-cigarette users. Compared to people who never smoked, current smokers were 18 times more likely to use e-cigarettes, the study found. Ex-smokers were more than twice as likely as people who never smoked to use e-cigarettes. People who used both traditional cigarettes and e-cigarettes were much more prone to respiratory symptoms like chronic coughing and wheezing that could indicate breathing disorders like asthma and COPD, the study also found. Big U.S. tobacco companies are all developing e-cigarettes. The battery-powered devices feature a glowing tip and a heating element that turns liquid nicotine and flavorings into a cloud of vapor that users inhale. 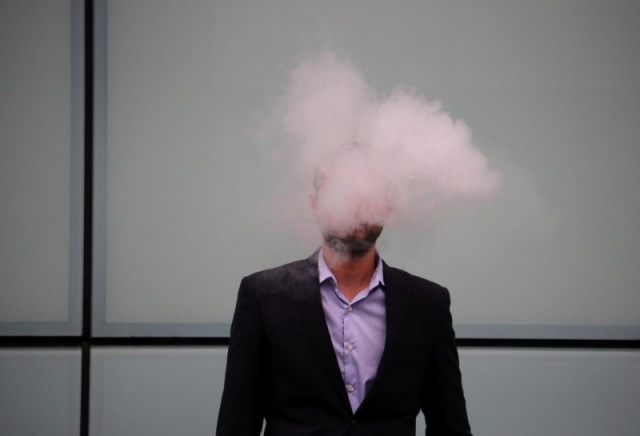 Even without nicotine, some research suggests that flavorings and other ingredients in e-liquids used for vaping could be linked to breathing problems. A big question about e-cigarettes, namely, whether they’re safe or at least safer than traditional cigarettes, isn’t answered by the current study. The study also was not a controlled experiment designed to prove whether or how e-cigarette use might influence the success of any smoking cessation efforts, and the survey did not ask smokers if they were trying to quit or cut back or using e-cigarettes for this purpose. Still, the findings suggest that people should be cautious about choosing e-cigarettes for health reasons, said Ilona Jaspers of the University of North Carolina at Chapel Hill, who wasn’t involved in the research. A drawback of the study is that it did not examine whether e-cigarette users were vaping with or without nicotine, which could impact the effectiveness of any cessation efforts, noted Hayden McRobbie, a researcher at the Wolfson Institute of Preventive Medicine at Queen Mary University of London who wasn’t involved in the study. The study also lumped together occasional and daily e-cigarette users into a single group, McRobbie said by email. While e-cigarettes may not be risk-free, and the long-term health outcomes from vaping won’t be known for years, it’s possible that breathing problems experienced by people who both smoked and vaped weren’t caused by vaping, said Dr. Konstantinos Farsalinos, a researcher at the University of Patras and the National School of Public Health in Greece.